Moving to a new home can be exciting and during a move most of the focus is on how to fit your belongings into a new space. Very few people put much thought into the home they are leaving behind. However, if you are coming from an apartment, there are several steps that should be taken to restore your rental it its original condition. Not only does this ensure that your security deposit is returned in full, it also helps guarantee a positive tenant reference from your previous landlord, should you ever need it. A landlord is much more likely to do both of these things for a tenant who leaves behind a well kept apartment. The first step is to pack up the boxes of your belongings and label them by room. Once that is complete, try to gather the boxes into one area of your apartment to make it easier to complete the cleaning and organizing tasks at hand. Be sure to purchase a variety of cleaning supplies to help you, such as cleanser, window cleaner, and disinfectant wipes. 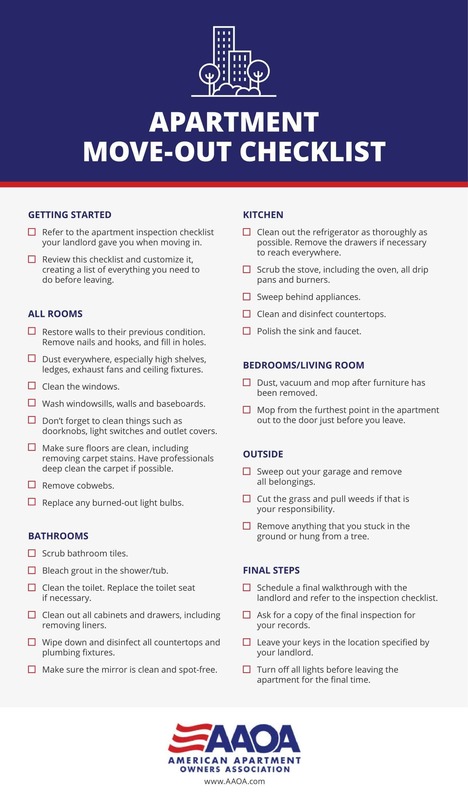 If you are having trouble figuring out where to being, the following move-out checklist can help you tackle each room at a time.